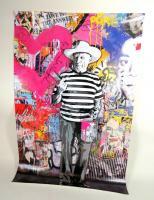 This print of Pablo Picasso is signed by Thierry Guetta aka Mr. Brainwash. Great buy for art enthusiasts. Condition: Very good condition. No rips, tears or marks. Signed twice by the artist. SHIPPING QUOTES INCLUDE SHIPPING INSURANCE.